The Tech Report shows off some screenshots of the new EasyTune, a piece of software that comes with Gigabyte's upcoming Haswell motherboards. The new application looks like quite a departure from the current version, it's a single tool that covers overclocking, power tuning and fan control. 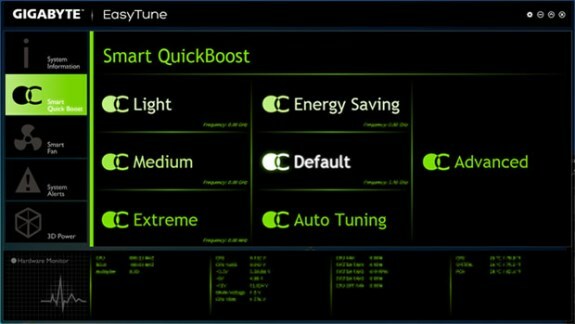 Based on the screenshot above, it looks like Gigabyte's Smart QuickBoost auto-overclocking scheme now includes an auto-tuning mechanism on top of its preset profiles. The auto-tuner should do a better job of honing in on a system's peak clock speed than the pre-baked profiles, which don't take system stability into account. Auto-overclocking mechanisms are great for newbies, and even seasoned overclockers can use them as a prelude to manual tweaking. EasyTune is likely to provide plenty of advanced options for folks who want to get their hands dirty.